Kathy Heicher/Enterprise This group of seventh graders from Eagle Valley Middle School have already raised $100 in relief money for the Gulf Coast hurricane victims. In the front row are Mayra Mauricio, Kate McGoodwin, Karly VanCampen, Conner Serba, Jaime Silva, and Matt Lucias. In the middle row are Nate Bauker, James Van Dyke, Luis Marquez, Jesus Almaraz, Tyler Keegan, LaDena Berg, and Lauren Shreeve. In the back row are Courtney Leeper, Katelyn Christian, Diego Grijalva, Horacio Tecia, Jordan Wilson, Jonathon Fernandez, Chris Eaton, Ethan Arnold, Anna Rasmussen, and Layna Siminoe. EAGLE – Millions of Americans found it heartbreaking to watch on TV as Hurricane Katrina laid ruin to big stretches of the Gulf Coast region. It was even more devastating to watch thousands waiting helplessly day after day for help and rescue.That’s why the students in Nicole Dewell and Molly Carnegie’s seventh-grade language arts class at Eagle Valley Middle School decided they couldn’t sit back any longer. “They want to be part of the solution,” Dewell said of her students. “They don’t just want to watch, they want to make a difference,”On Sept. 2, Dewell and Carnegie’s students decided on the spot to set up a bucket in their classroom to collect funds to help the victims of Katrina. They hand-decorated the bucket, adding sayings like, “We Care,” and “Please Donate. 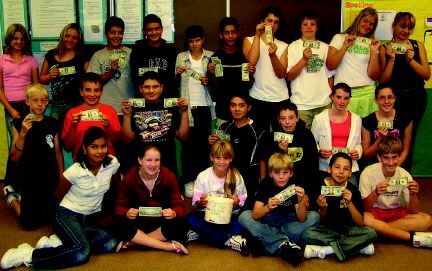 They Need money.”To kick the bucket relief drive off, many of the kids in the classroom chipped in whatever change they had in their pockets as soon as the bucket was decorated. Austin Woodworth plunked down $12 he had earned mowing lawns over the summer, Devanie Burnett immediately donated $10 and Principal Jerry Santoro came by and opened up his wallet for the cause as well.That afternoon the students were busy making signs to put around the building, and writing and then reading schoolwide announcements to encourage other students to give, too. By the end of the school day last Friday, they had already collected $35. By mid-day on Tuesday, they had nearly $100. And they hope to collect far more. The money will be passed on to the American Red Cross, which will forward the money to the hurricane victims. Jordan Wilson speculated that the funds would go to help buy food or build new roads. “It will probably be used for the damage that Katrina left behind,” said Jaime Silva. Conner Serba wants the funds to go toward concrete for new levees. Anna Rasmussen wants the money spent on toys for the children whose families lost everything in the flood. James Van Dyke and Chris Eaton think buying food and water is most important.